Redbooth’s business collaboration tools let you manage projects and stay connected with your team and clients — anytime, anywhere. Create shared workspaces where you and your team can instantly access tasks, data, and each other. Access collaboration tools like project and task management, chat, HD video conferencing, screen sharing, and reporting, your team can be aligned and on the same page every day. Now, your team can can be aligned on shared goals, no matter where they are. Delegate with peace of mind. See what’s on track and what’s in danger of falling behind with Redbooth’s beautiful reporting analytics. 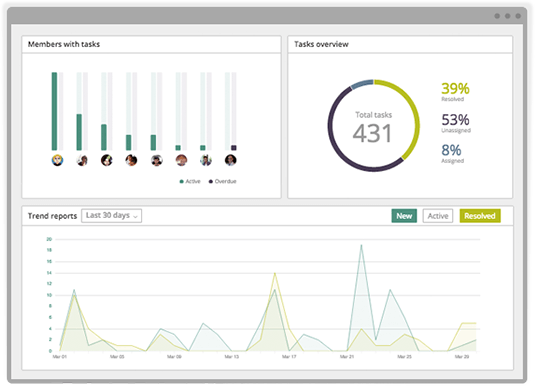 You can easily track team progress, review planning estimates, and review top-level metrics. Your team can stay on the same page with each other as a project evolves. Transition seamlessly from desktop to mobile with iPhone, Android, and iPad apps. Take Redbooth beyond the office on your smartphone or tablet without losing the ability to chat, participate in a video conference or screen share, and update projects and tasks. Get your best talent out of their inboxes and into business collaboration tools that accelerate productivity and enhance communication. Hundreds of hours per person are wasted in email every year. Redbooth lets you take back valuable time and accelerate growth. Discover the power of Redbooth for collaboration. Start today and see why thousands of companies are using Redbooth's business collaboration tools.